No corner blocks = cheap fiddle? September 17, 2018, 3:11 PM · Is this always the case, or were there decent instruments made sans the corner blocks. September 17, 2018, 3:32 PM · My understanding is that built-on-the-back violins didn't need corner blocks--it was just how they were made. I have seen several 18th-c. Vogtland violins that were very nice and didn't have corner blocks, but many more Dutzenarbeit violins from the early 20th-c., coming from the same region, that were, uh, less than "decent." So, it depends on the violin. September 17, 2018, 10:00 PM · Not cheap, just a regional variant and typical for the time. Blocks were made necessary by the use of the internal mould in Cremona. September 18, 2018, 12:37 AM · I think some of the first generation violins ~16-17th century , were made that way. September 18, 2018, 2:29 AM · For the record I have always liked very much the cornerless Chanot violin. I always thought it was an efficient and minimalistic approach. Taking out the corners and the tailpiece, and I heard that the sound was very good. 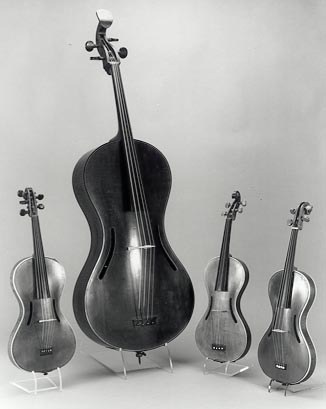 The Carbon Fiber violins made by Mezzo Forte and Louis and Clarck (among others) are also cornerless. According to them, the corners are a construction and structure need that carbon fiber violins don't have. Edited: September 18, 2018, 5:05 AM · Thanks for the replies. From what I've read, most inexpensive, mass produced violins from Germany, Romania (and later, Chezcoslovokia) had no corner blocks. I have also read the lack of corner blocks affects the resonating characteristics in an unfavorable way, lumping these instruments in the dreaded VSO category. I have two old violins with no corner blocks, purchased as salvage projects. One is now playable. It has a rather dark tone and is quite loud under the ear, even with light bow pressure, and it resonates quite strongly on all strings. (Perhaps this is due to the cheap strings installed!) I will try a better set of strings on it soon, to see if that changes the character. It has a fake Strad label, but no country of origin label, or makers' name, so it may predate the Sherman Act. The other is a clearly labeled Czech-made fiddle from the Cold War era. It is awaiting a new neck and fingerboard. In comparison to my other violins, this one has a high arched belly. Perhaps it will end up as wall art. September 18, 2018, 9:52 AM · I think we have to distinguish cornerless from blockless where the pointy corner bits are not filled with a block. I have 3 cornerless violins and 1 cornerless viola. Obviously I like them! The air capacity inside a cornered violin is the same as a cornerless violin as long as it is not blockless! Interestingly, the maker of one of my cornerless violins also experimented with blockless corners. There was some patent in German and a friend translated it roughly - some kind of idea with free vibrating overlaps in the corners. Hard to describe and remember exactly what this was but I think it shows that not all blockless violins are necessarily cheaply made violins - sometimes there is a reason. This is fairly rare though and generally, I believe, blockless are often more cheaply made. I put a decent violin up for sale which did not have blocks and the luthier selling it added blocks as it's one of the things people look for when they buy a violin. Edited: September 18, 2018, 1:45 PM · Christopher, I will probably add corner blocks if I ever open up this violin again. I'm thinking of regraduating the top plate, at least on the treble side, where it has prominent grooves. If I do, the blocks will be added. I do like the cornerless look, Carlos. A more shapely figure, to be sure. It (cornerless construction) seems to work just fine for guitars, though I'm not sure I'd want a violin without a tailpiece. I was hoping Lyndon would comment, since he trades in old European violins. September 18, 2018, 6:15 PM · Yeah, what a bad idea to regraduate and add corner blocks, leave them the way they were made. September 18, 2018, 8:05 PM · Thanks, Lyndon. What's your take on the original post, i.e. general quality of violins with no corner blocks? Are they really inferior, or does it depend? Edited: September 18, 2018, 10:39 PM · I'm curious to hear what Lyndon has to say. I own one of these violins, inherited from a relative in rural Prince Edward Island, who had bought it from Eaton's Catalogue around 1901 for three dollars. German factory violin with "Conservatory Violin" stamped on the scroll. With Tonica strings, some repairs to the top plate, and a decent set-up by a skilled luthier, it actually sounds fairly good today, much better in fact than most cheap modern Chinese instruments that I have tried. A bit hollow-sounding, perhaps, definitely a cheap violin, but fun to play, and it is a super instrument for scordatura fiddle music (tuned to AEAE), where its natural resonance is desirable. For sentimental reasons, I spent a good deal of money to get it playable again after half-a-century hidden away in an attic, but I doubt very much whether it could be rebuilt into a better instruument by adding corner blocks. I treasure it for its history, and for what it was, but I don't think it has the potential to be significantly improved, and I intend to leave it the way it was made. September 18, 2018, 10:55 PM · I've come across some really crappy Mittenwald violins made with internal mold and inset corner blocks, best to leave the violin the way it was made, its a piece of history, it doesn't need your "improvements". To possibly improve on it you'd have to have a much better understanding of violin making than the maker, which for most amateurs is very unlikely.